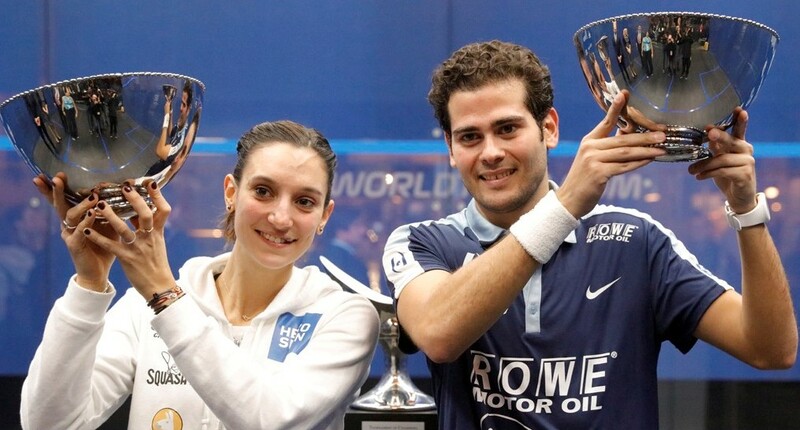 French duo Gregory Gaultier and Camille Serme derailed the challenge of 2016 tournament winners Mohamed ElShorbagy and Nour El Sherbini to come through two dramatic and enthralling semi-final encounters at the 2017 J.P. Morgan Tournament of Champions. 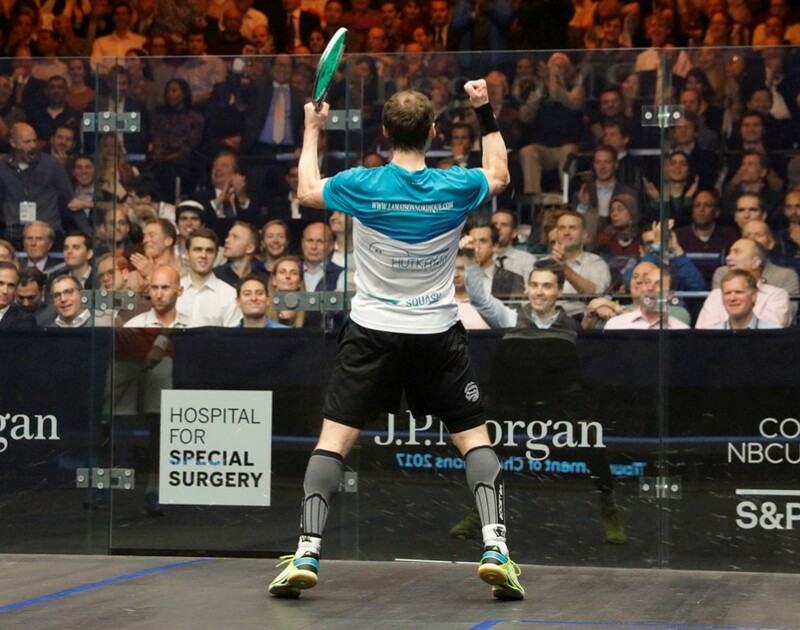 Inside Grand Central Terminal’s Vanderbilt Hall Gaultier, the 2009 champion, prevailed 12-10, 11-9, 9-11, 4-11, 11-7 in an 84-minute encounter with 2015 and 2016 winner ElShorbagy that had the theatrics, drama and intrigue befitting a Broadway classic. 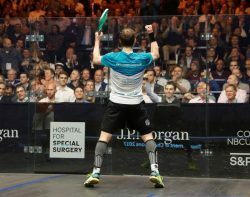 The 34-year-old strutted extravagantly around court, playing with pace, precision and guile to take a 2-0 lead, delighting the crowd with his theatrical celebrations before a contentious referee decision at 8-7 in the third swung the match. 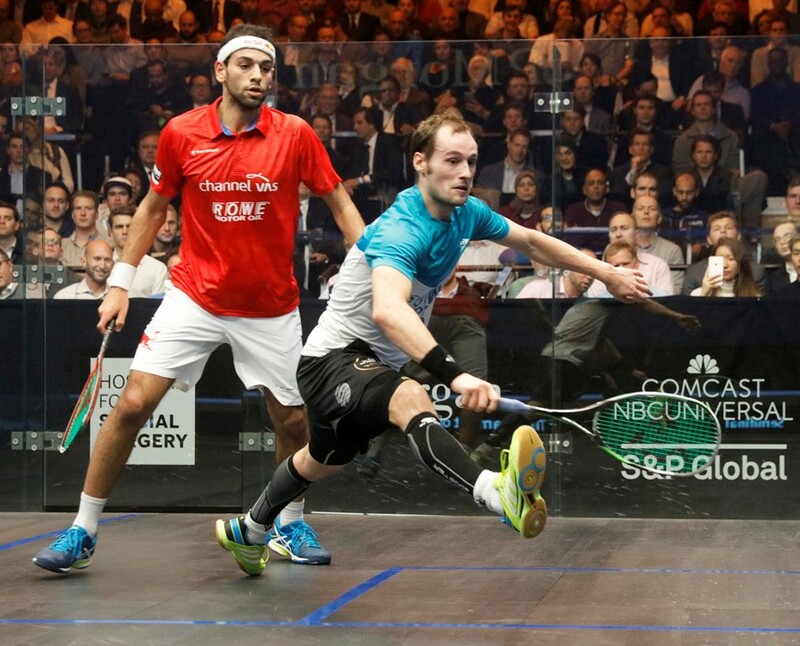 The Frenchman capitulated, first mentally and then physically – as a troublesome left glute hampered his movement – allowing ElShorbagy to level 2-2. But a stunned crowd, silenced by what they were witnessing, watched on as Gaultier, playing on one leg, displayed all the traits of his ‘General’ moniker to regain control and seal a dramatic victory. “I felt my glute go during my match with Tarek (Momen) and it was sore this morning – but after warming up today it was fine and I had no problem in those first two games,” said Gaultier. 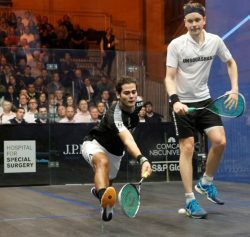 “In the third game I could feel it tighten and then at 8-7 that decision should have gone my way and I lost my dynamic. I could have gone through to win 3-0 and then it was 2-2. At that point I just wanted to shake hands – I was in a lot of pain. “But my coaches told me just to fight for every point. I played smart and it maybe got in his head and he got a little shaky. I was injured all year in 2016 – so I am very determined to come back. 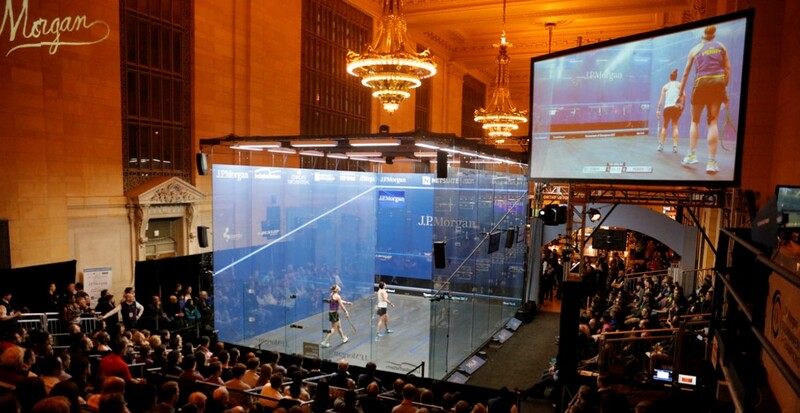 This is a beautiful place to play squash and you want to give your all in these kind of locations. 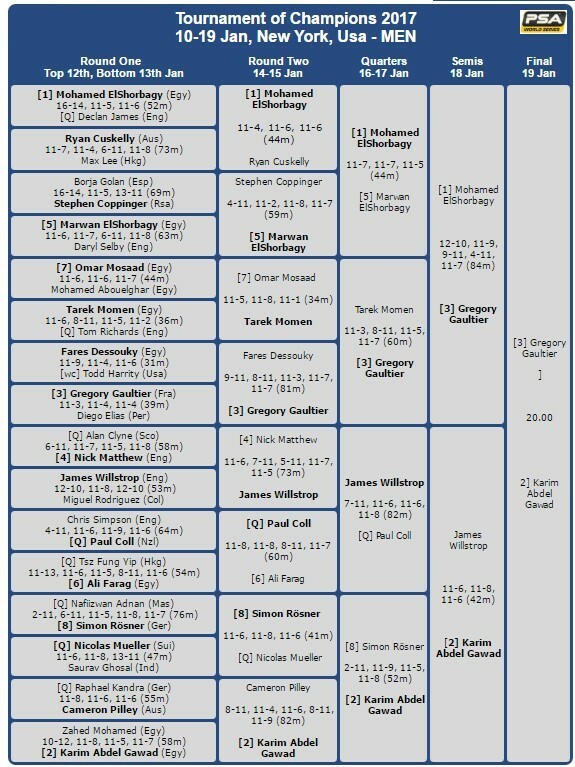 Gaultier will face Egypt’s World Champion Karim Abdel Gawad in the title-decider after he produced a sublime performance to beat unseeded semi-finalist James Willstrop, who had ended a ten-year losing streak to beat compatriot Nick Matthew in the second round, in straight games. 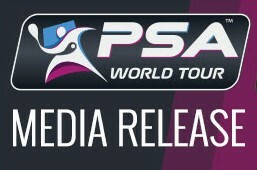 In the women’s draw it was Gaultier’s compatriot Serme who captured attention with a 3-1 defeat of World No.1 El Sherbini. 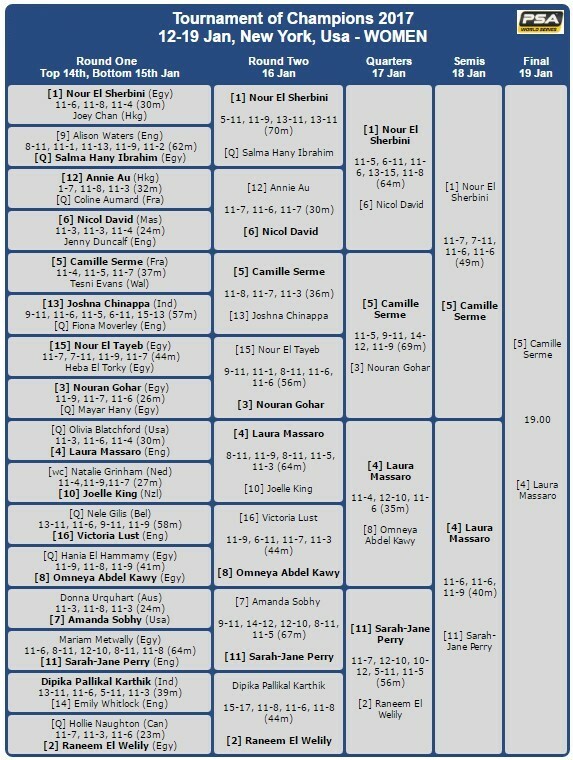 Serme beat World No.2 Nouran Gohar yesterday and injected pace from the off today to unsettle El Sherbini, working her favoured backhand with relentless accuracy, to win 11-7, 7-11, 11-6, 11-6 and secure her first appearance in the iconic event’s title-decider. 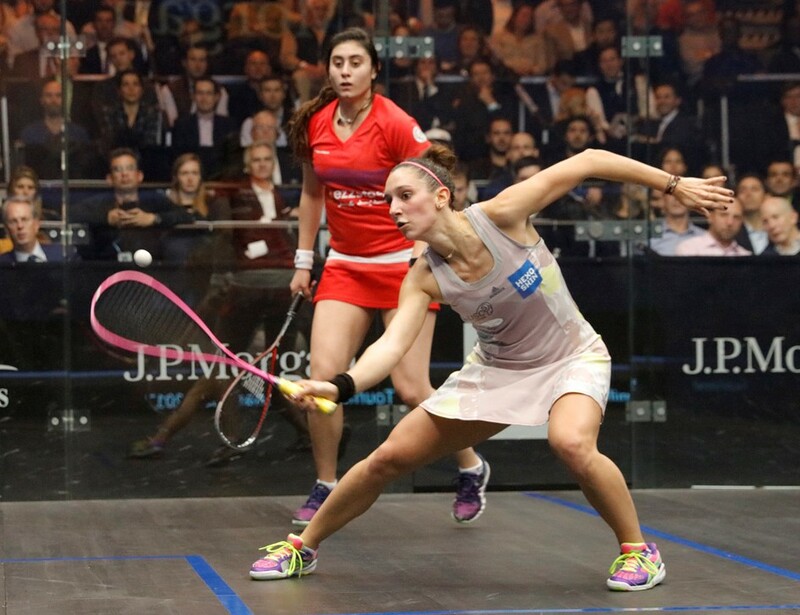 “I was so focused on the match and making sure I played as well as I could that it hasn’t really sunk in that I’m into the final yet,” said 27-year-old Serme. 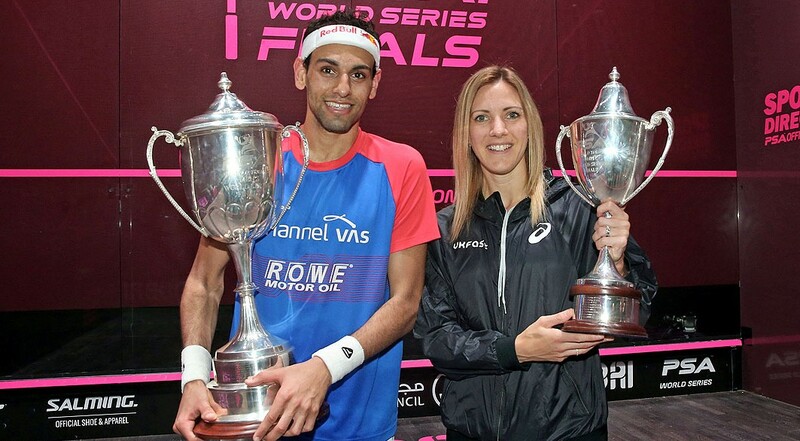 “I dreamt of playing this event – the venue is unbelievable – so it’s amazing to know I will be playing in the final here tomorrow with a chance to win. 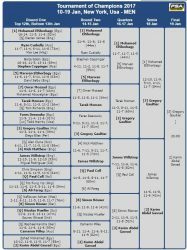 I’ve beaten the #1 and #2 players so I have to take confidence that I’m playing some of my best ever squash. 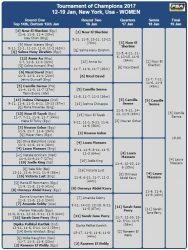 Serme will face England’s Laura Massaro, the 2014 ToC runner-up who beat surprise semi-finalist Sarah-Jane Perry in straight games, in the final ensuring a new Women’s champion will be crowned.